Here are some facts about John Cabot. 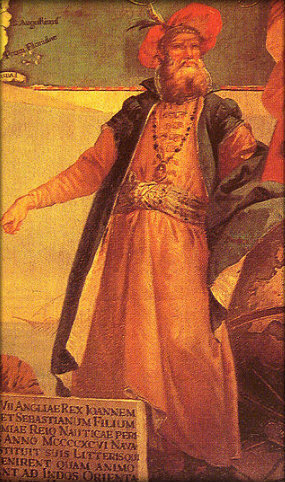 John Cabot lived from about 1450 until 1499 and was a well known navigator and Tudor explorer. He is credited as being the first European to see North America since the Vikings. John Cabot was born in Italy, although his exact birthplace is not known for sure. Cabot’s family moved to Venice when he was 11, where he was taught navigation and sailing from Italian seamen. He also spent time in Seville, Spain where he worked on building a stone bridge. In 1488, Cabot moved from Venice (Italy) to Valencia (Spain) to Seville (Spain), before finally arriving in England to secure funding for an Atlantic voyage. In May, 1497, Cabot sailed in his ship, the Matthew, west from Bristol, England, trying to find a shorter sea passage to Asia. He actually sailed to North America. Nobody knows for sure where Cabot landed; it may have been somewhere in Canada (perhaps the island of Newfoundland) or in Maine, United States. Cabot was hailed as a hero when he arrived back in England. King Henry VII gave him permission to undertake another voyage to America. Cabot sailed again in May, 1498. Nobody knows for sure whether Cabot reached North America a second time, or whether his ship was lost at sea. Some historians have suggested that John Cabot did reach America and established a religious colony. If so, it was the first Christian settlement in the New World. There are many reminders of John Cabot in Bristol, England. A 300 foot sandstone tower commemorates the explorer and there are a school and shopping centre named after him. Cabot is also celebrated in Nova Scotia and Newfoundland, Canada. There are several statues to the explorer, as well as a 200 mile scenic drive known as the Cabot Trail. In 1997 a replica of John Cabot’s ship, the Matthew, sailed across the Atlantic from England to Newfoundland. It was greeted by Britain’s Queen Elizabeth II, along with members of the Canadian and Italian governments. John Cabot’s son, Sebastian Cabot, was also explorer and he made several voyages to North America. What next? Discover more Tudor facts, learn about Christopher Columbus (another Tudor explorer) or find out about voyages of exploration. this website is really inspirational for my school pupils. This is a very good website to look up John Cabot. I really think this is for a 4th grader that needs to look up info on him. He is a really cool explorer for sure. I have to write 5 facts and the 5 facts that I have are AMAZING. My teacher says the facts are college facts.